This post was written by Trevor Hultner and originally published at the Center For a Stateless Society (C4SS) under the title “Dismantle the Police.” Posts and other content you think are worth sharing with the CopBlock Network can be sent in to us via the CopBlock.org Submission Page. In the post below, Trevor discusses the recent shooting of Terence Crutcher in Tulsa by Officer Betty Shelby after his car broke down. (See embedded videos below.) In addition, he discusses what that shows about the state of law enforcement as an institution. His conclusion shouldn’t be hard to figure out based on the title of the post. Personally, I came to the conclusion years ago that policing as we know it today is neither the best nor the only system for protecting people within our communities. However, we have now reached the level that a simple car breakdown is treated not as a situation where someone may need a bit of help, but rather as a crime scene necessitating deadly force. I’m pretty hard pressed to understand how any rational, thinking person could feel otherwise at this point. Last week, Tulsa, Oklahoma police officer Betty Shelby fatally shot 40-year-old stranded motorist Terence Crutcher in the back after another officer tased him to the ground. The database killedbypolice.net lists Crutcher as the 825th individual to have been shot and killed by a cop in 2016. At this point, it’s clear that nothing short of a complete dismantling of the police force is necessary to stop them from killing black men and women. There are simply no more justifications to be made here. No more claims of “bad apples,” no more room to use the officer safety argument. Police feel vested with the power to kill anyone they please, and they absolutely know it. This isn’t even the first time an unarmed black man has been killed in Tulsa County within the last two or three years. Either we take the entire system apart or this keeps happening. There are no alternatives. Disobeying a police officer is not grounds for murder. Handling potentially volatile situations with a cool head and a relaxed trigger finger is ostensibly why we even keep police around in the first place. If we can’t even trust them to keep that commitment, how can we trust them to reasonably keep our communities safe? No, it’s time to wipe the slate clean and start over. The time is high for us to have a conversation about what proper community protection looks like. We should be attempting to put those new ideas into practice, and we should be doing so while every officer turns in their badge and gun. Some may find that to be overly harsh. That’s fine. Those are likely the same individuals who misconstrue Colin Kaepernick and dozens of high school and college football teams’ kneeling protest during the national anthem as being “unpatriotic.” No. The fact is, they’re protesting this. They’re protesting the fact that this keeps happening while the people who perpetrate these crimes get away with it, nearly always consequence-free. It should be astoundingly easy for even the most casual layman to see that. 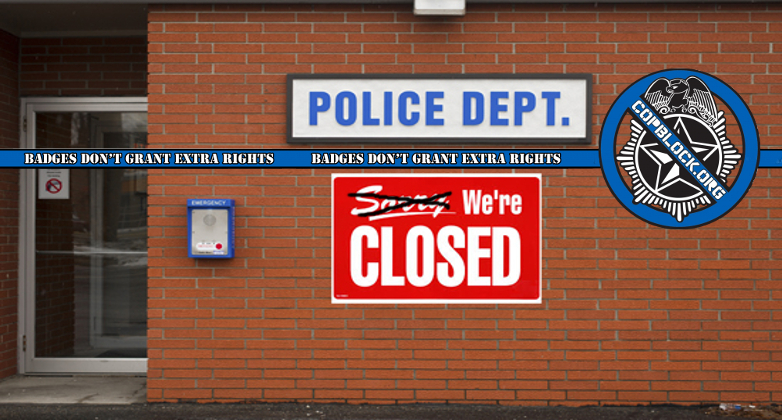 It’s time to dismantle law enforcement.